← So What Does The Person Really Want? 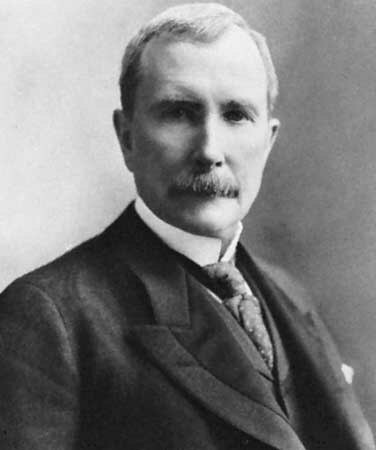 John D. Rockefeller had a difficult childhood. His family bounced between poverty and comfort because his father was a con-artist. The elder Rockefeller traveled the countryside of upstate New York selling patent medicine which was often simply “snake-oil.” The Rockefellers didn’t fit in the small New York village where they lived.Just like most small towns, everybody knew each other. Gossip and rumor spread like wildfire. And the village scorned Rockefeller’s father who they correctly labelled a snake-oil salesman. Whispers followed the family, they were excluded from social life and young John could not help but hear the vicious things the villagers said about his family. Because they were ostracized, Rockefeller quickly developed a thick skin and a calm demeanor that helped him ignore the verbal barbs from the villagers who thought the sins of the father should blemish his son.Soon people began commenting on the boy’s almost Buddhist detachment from events that kept him from getting angry or flustered, even when his father committed the ultimate sin and abandoned their family.Throughout his childhood, Rockefeller built a fortress of calm. And this fortress served him on his journey to remarkable success.When Rockefeller sat down to negotiate, it was impossible for people to emotionally manipulate him. Even when he sat in front of a hostile Congress who wanted to destroy the company he built, Rockefeller remained calm and composed during the crisis.Nothing could faze him. Most people, when faced with any negotiation, let their emotions rule. That’s a major mistake. If you let your emotions reign during a negotiation, you will be crushed.But it’s hard to remain calm especially when you’re trying to get something that you really want,whether its buying a new car, trying to close on a house, or simply convincing your spouse to do something for you. Think back to the last time you had a major negotiation.You probably felt nervous and anxious. You may have struggled to say the right thing without stammering. You may have felt clammy or even a little nauseous.That’s okay. It’s normal to feel like that when the stakes are high. But you can work around those feelings using this simple Rockefeller trick. When you enter a negotiation of any kind, before you start talking, take a moment of quiet to compose yourself. Be silent for a second. Don’t rush into things or tip your hand. Take a deep breath and enjoy the silence for a moment. Rockefeller would enter a negotiation softly. He waited a moment before he said anything. If you follow his example, you will immediately feel calmer.The worst thing you can do when negotiating is try to rush things.Don’t forget that during your brief silence, the other person will feel just as uncomfortable as you.After you collect your thoughts, compose your first sentence and speak it calmly and confidently.Don’t worry about moving fast.If you do rush, it immediately sends the signal that you’re nervous, scared and overwhelmed. That’s not the impression you want to make.A calm tone and a slow pace is your friend here. Later in his career,Rockefeller surprised people he met because he was so calm and genial, even during hostile negotiations. They expected that the king of the Robber Barons would bluster and rage. But he didn’t. He.He simply stayed still.And he spoke calmly, quietly and never rushed. It’s a rule in negotiations that if you lose your cool then you won’t get the deal you want.Stay calm and you’ll be just fine. Beyond learning to stay calm, Rockefeller learned another valuable lesson early in his career: threats don’t work. Businessmen who lose their cool during a negotiation and make threats when things weren’t working in their favor are engaging in destructive behavior that almost always damages the budding relationship and costs them dearly.Threats ruin relationships. And a rich life and career is built on great relationships.Rockefeller never made threats, even when he was the richest and most powerful business owner in the world. In fact, Rockefeller was happy to slightly overpay for things in order to maintain and build relationships. If you work on remaining calm during the negotiation, you’ll become more persuasive, more rational and more likely to get what you want. It’s one of the most valuable skills for living a rich life.So keep calm and negotiate it.